Poster Design by Joe Wack! 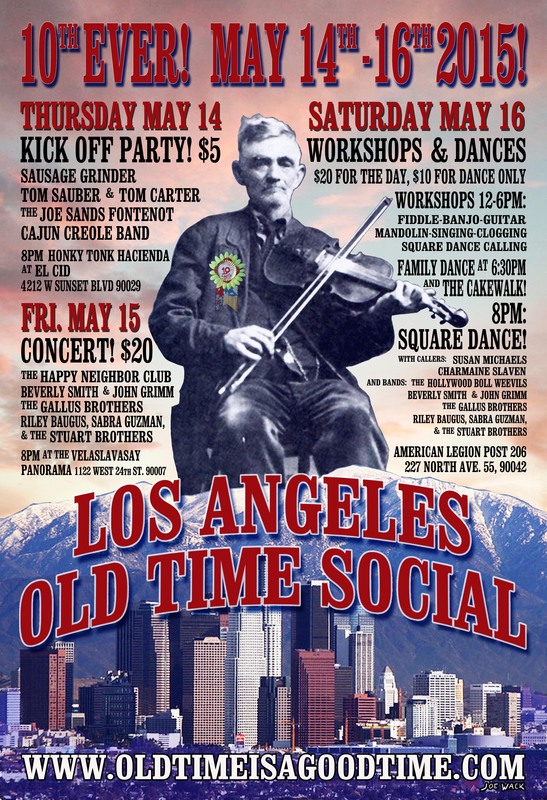 This year is the 10th Ever Los Angeles Old-Time Social! Thurs. 5/14, 8pm $7, 21+: Kick Off Party! Full Kick Off details and band bios HERE!! **Pre-sale tix available HERE & NOW!!! House band for the night – LA’s own The Happy Neighbor Club!!! Full Concert details and band bios HERE. Sat. 5/16, 12-11pm, Workshops & Square Dance! $20 for the day (workshops included) or $10 for the Dance only. For caller and band bios coming soon! This entry was posted on Wednesday, February 17th, 2016 at 6:11 pmand is filed under . You can follow any responses to this entry through the RSS 2.0 feed. Both comments and pings are currently closed.